This past Saturday individuals across over 40 political ridings gathered together in front of their respective MPP offices in support of their initiative to defund abortion from Ontario health care. 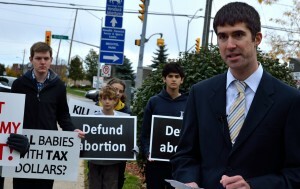 The Campaign Life Coalition, a pro-life organization, spearheaded the rallies, arguing that abortions should not be funded by tax dollars because they believe the procedure to be medically unnecessary. 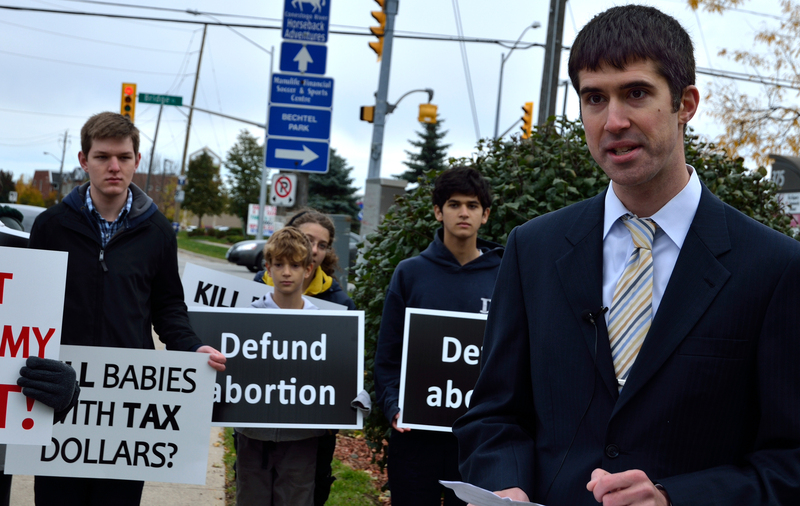 “Many people in Ontario are not aware that all abortions are fully funded by the taxpayer, whether they’re medically necessary or not. We’re just drawing awareness to the fact that this does cost money and tax dollars are scarce,” explained Alex Matan, a high school teacher and one of the main organizers of the rally held in Waterloo at the office of MPP Catherine Fife. Matan went on to explain that he feels resources need to be allocated as efficiently as possible, and this is fundamentally the issue that he and fellow protesters have with the current system. Widerska went on to explain that the purpose of motion 312, recently a controversial political issue, was to prevent very late abortions from happening. Motion 312 was defeated by the House of Commons in a vote of 203 to 91 in late September. The bill was presented by Kitchener Centre MP Stephen Woodworth and had the support of Cabinet Ministers such as Jason Kenney and Rona Ambrose, despite Harper not getting involved. These legal rights are of particular concern to young women, on both sides of the abortion debate and a critical point that is often raised is the fact that females under the age of 18 are permitted to get abortions without parental consent.